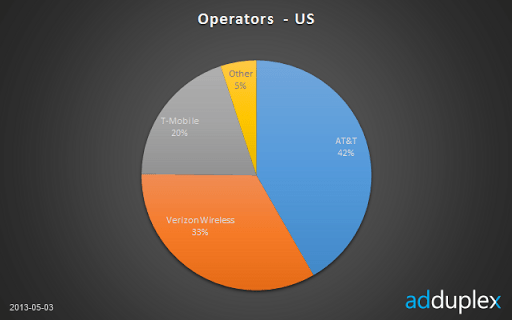 It is time for the new installment of our Windows Phone statistics report. Let’s see what’s changed over the month, how new devices are doing and a few looks on the data from some new angles. This report is based on data collected from 579 Windows Phone apps running AdDuplex SDK v.2. The raw data analyzed was collected over the day of May 3rd, 2013 (UTC time). We have made every attempt to consolidate different reported phone model names under their canonical retail model names, but it is possible that some of the rare model name variations were not accounted for. 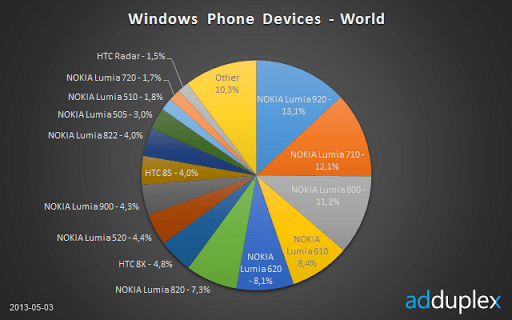 Last month we’ve seen Lumia 920 taking the crown as the most popular Windows Phone out there. This month the 920 has strengthened its lead, but the more impressive stat this month is that Lumia 520 has entered the charts straight at no.8 and 4.4% of the total market. Not much has changed in the global manufacturer rankings. It looks like Nokia’s share growth has peaked (at least for now) at 80%, which is probably a good sign for everyone involved. Let’s take a look at the manufacturer data from some different angles. As you can see Nokia has gained its share rapidly in the early days of Windows Phone 8 and then set on a path of slow, but steady growth. It looks like the bulk of its growth is happening at the expense of Samsung, and HTC is keeping its share pretty much intact. 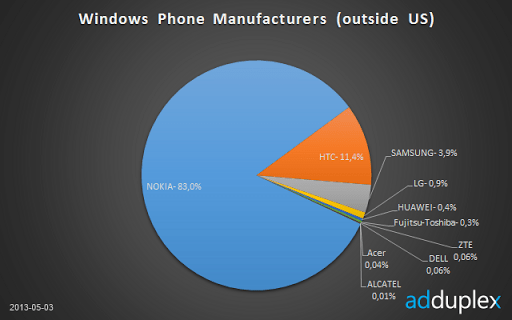 We can get some interesting insights by looking at the Windows Phone 8 manufacturer data separately. 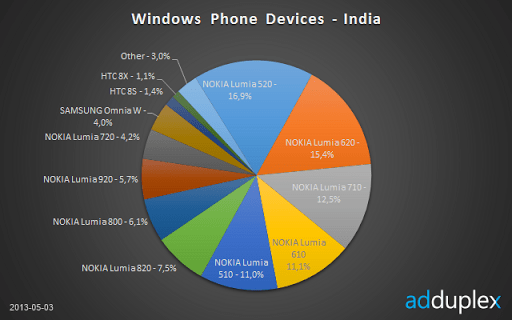 Nokia is as strong on WP8 as in the whole Windows Phone ecosystem in general. 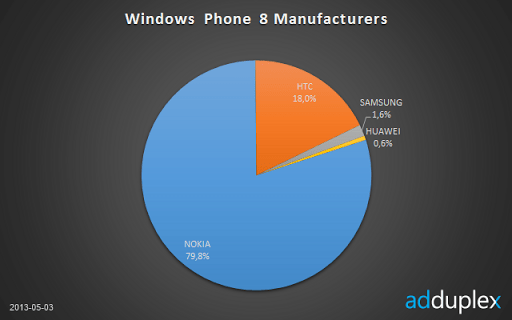 What’s interesting is that HTC is actually a most notable winner on WP8 and Samsung is the most notable looser. 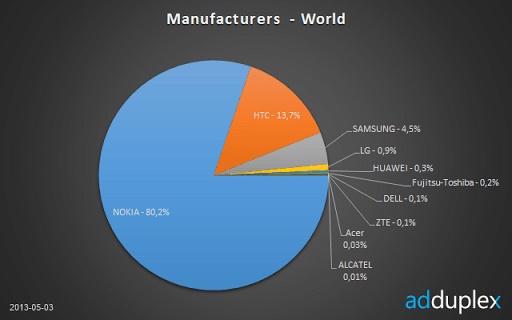 HTC is particularly strong in US where it has almost 26% and where Nokia is not as strong as it is elsewhere. And how strong is Nokia in the rest of the world? 83% strong. It almost happened, but it didn’t. Windows Phone 8 has gained more than 6% over the month, but it stopped a few steps short of overtaking WP7. 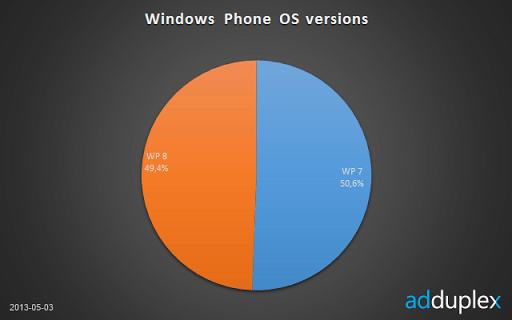 AdDuplex is Windows/Windows Phone exclusive and therefore we have no way to compare Windows Phone to other platforms. That said we found one metric that could give us some insight into the growth (or lack of) of the whole Windows Phone ecosystem in general. The chart above shows us the average numbers of unique users in Windows Phone apps participating in the AdDuplex cross-promotion network. This is based on all apps on the network (not only the SDK v.2 apps like the rest of the report). 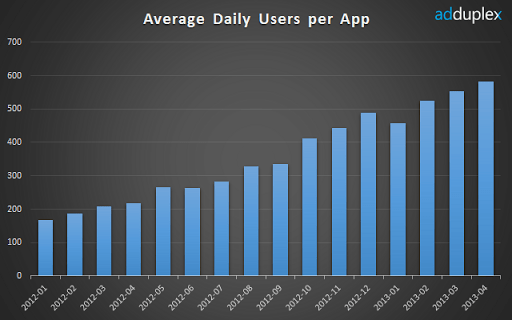 To calculate these averages we’ve discarded the top 5 results each month and all apps with less than 2 daily active users. These numbers are obviously affected by the popularity of apps joining (or leaving) AdDuplex, fill rates in other ad networks (when AdDuplex is used as a fallback) and the growth of number of Windows Phone users in general. They are also negatively affected by the growth of the total number of apps on the platform (more competition for the same users). But, as you can see, there’s a generally positive and steady trend in these numbers. Over 2012 average DAU has grown about 3x which isn’t bad at all. That said, the growth is obviously linear and we would love to see something more exponential here. Everything is pretty stable in the US. 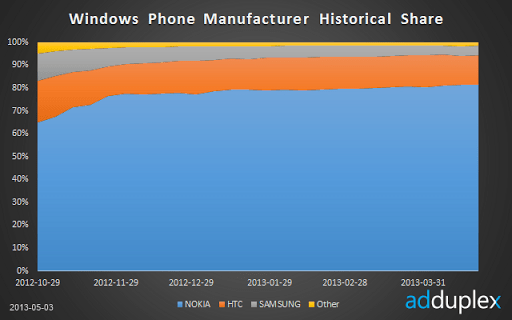 These charts are here mostly as a snapshot of the situation before Lumia 928 is released on Verizon. And speaking of mobile operators there were no dramatic changes, but Verizon is continuing its growth at the expense of both AT&T and T-Mobile. 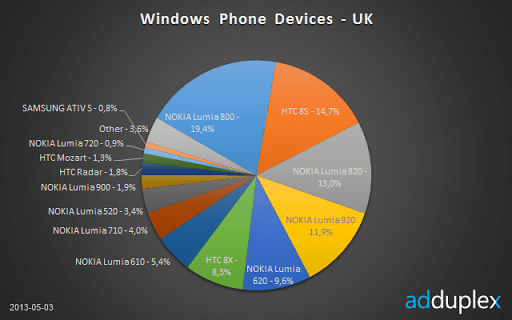 Lumia 800 is still the Windows Phone king in the UK, but HTC 8S and other WP8 devices are getting close. 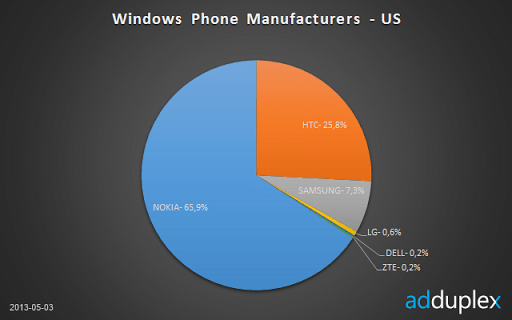 Actually, 5 out of 6 top Windows Phone devices are the WP8 models. Let’s take a look at some of the countries where Windows Phone has got the biggest overall market share, crossing 20% in some. 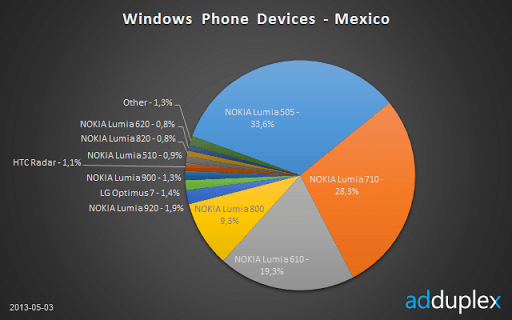 We can clearly see that low-end Windows Phone 7 devices are responsible for WPs gains in Mexico. Unfortunately, you only start seeing WP8 devices when you get to low single digits. Hopefully this will change soon. Another 20% country is Poland and the situation is much brighter there, especially comparing to just 2 months ago. 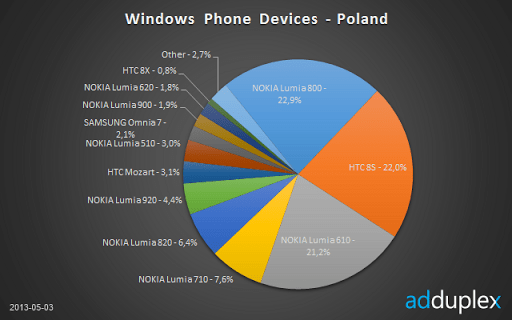 Even though WP7 is still obviously dominant, HTC 8S, Lumia 820 and 920 together make up more than a third of all Windows Phones in Poland. Russia is another big Windows Phone market and unlike other big markets it’s not ruled by the cheap Nokia model. Lumia 920 is the most popular Windows Phone in Russia. 4 out of 5 top phones are WP8 too, which is a great sign. But the most interesting tidbit this month comes from India. 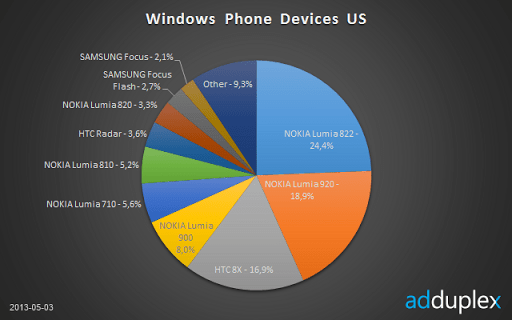 After less than one month on the market, Nokia Lumia 520 is already the most popular Windows Phone there! This brings us to the “rumor” section of this report. Let’s see what we’ve seen lately. We’ve also seen quite a few phones running Windows Phone 8.1 mostly on the Nokia P4301 test device, but on a few 8X and Lumia 920 too. Builds: 8.10.12072 to 8.10.12079.0. AdDuplex is the largest cross-promotion network for Windows Phone and Windows 8 apps empowering developers and publishers to promote their apps for free by helping each other. AdDuplex was established in January 2011 in Vilnius, Lithuania. As of May 2013 close to 3,000 apps actively use AdDuplex to gain more visibility.